That's my reaction ever since I turned 30! And that was 7 years ago so it has been a good 7 years that I haven't touched a PINK blush unless I am going to apply that on a teenager or a young client! Then one day, I met with Poise Makeup Professional and found a subtle matte pink cheek color that I can finally call MINE. Meant for every age. Rich pigmented formulation with minerals, vitamin E and botanical extracts to provide a silky, soft, light weight application. It looks boring on pan, it is a muted cool-tone pink blush with purple undertone. It looks extremely matte on pan but upon swatch, you can see a luminous "sheen" that doesn't scream "oily". Now from the fingers to my cheeks, how will it fair on me who, most of the time, looks unnatural on a pink blush? The powder is extra smooth and velvety. It glides onto my cheek with no friction and fallout. 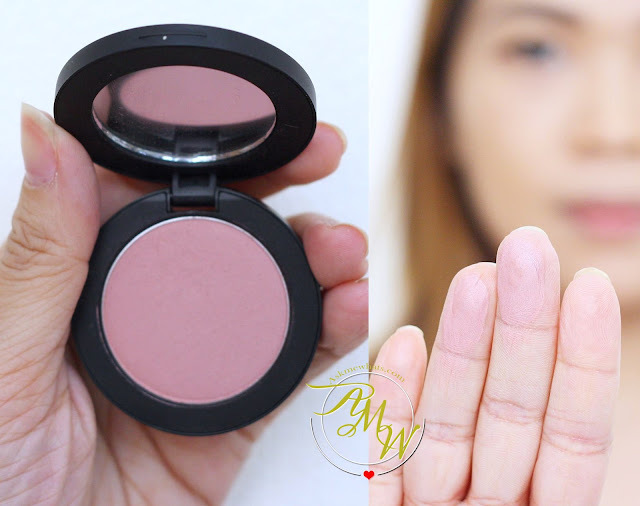 1 layer will achieve a very subtle and light "blush". Adding 2-3 layers will give a more define look but still subtle enough to be called a daily cheek color. The color works for light to medium skin tone. Users with darker complexion may need to apply more. It gives a healthy glow at the center of my face without the extra need to apply highlighting products. Adding a "contour powder", the Poise Cheek Color in Seattle is a nice "transition" shade making the "contoured area" look more natural than usual. See that extra glow on my cheeks? That's all POISE! Overall, I am very happy with the shade. One pan may last me a long time because the blush is highly pigmented. Poise Makeup Professional Mineral Cheek color is priced locally at Php850.00 (approx $18.00). Available HERE for now. Do you have a favorite pink blush? It's not pink pink. I dunno, I happen to like pink blushes because it makes one look more youthful. The macaron puff de cheek pink blush by majolica Majorca is my fave.